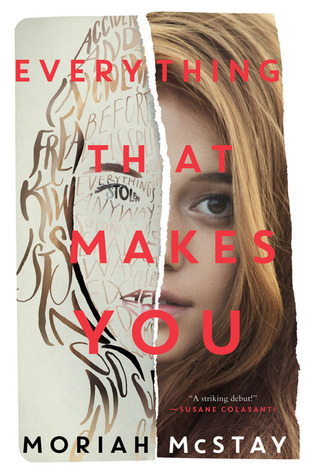 As a member of the Fearless Fiteeners, I was able to read an ARC of Moriah McStay’s young adult novel, Everything That Makes You (3/17/2015; Katherine Tegen Books). ARCs (Advanced Reader Copies) are the uncorrected proofs that are sent to reviewers, librarians, and book bloggers to promote the book. My fellow fifteeners and 2k15 classmates are sending their ARCs on tour, which allows us a sneak peek at these upcoming new releases. I’ve decided to let you all know about the ARCs I’m reading to help support my 2015 debut colleagues. Here’s the description: One girl. Two stories. Meet Fiona Doyle. The thick ridges of scar tissue on her face are from an accident twelve years ago. Fiona has notebooks full of songs she’s written about her frustrations, her dreams, and about her massive crush on beautiful uber-jock Trent McKinnon. If she can’t even find the courage to look Trent straight in his beautiful blue eyes, she sure isn’t brave enough to play or sing any of her songs in public. But something’s changing in Fiona. She can’t be defined by her scars anymore. What I liked about it: I was entirely impressed by Moriah McStay and the crazy skills she must have to write this full dual narrative. The two stories of Fiona/Fi hinge on a question we have probably all asked more than once in our lives: “What if _____?” McStay explores this idea by creating two lives of the same person. In one, Fiona’s face is scarred from a childhood accident, and she wants desperately not to be defined by or pitied because of her scars. In the other life, Fi’s face is flawless and she seems to have everything going for her, but….I won’t spoil anything because I’m not that kind of reader. But here are a couple of things I loved about McStay’s novel. I love how certain people crossed paths with Fiona/Fi in both lives, suggesting there are certain things that are meant to happen, yet the element of free will isn’t ignored and most definitely alters the details. Also, I love the point that no matter what, every life has joys and tragedies. A flawless face doesn’t mean a perfect life. No matter which road Fiona/Fi is on, she (and we all) will face certain challenges. About the author: Moriah McStay grew up in Memphis, TN, where she acquired a come-and-go drawl and a lifelong love of cowboy boots and fried pickles. She attended Northwestern University and the University of Chicago. Two graduate degrees and seven jobs later, she finally figured out what she wants to be when she grows up.